This has been a pretty wonderful year for coffee. Right now, I have some goodies from Kuma Coffee here in Seattle. 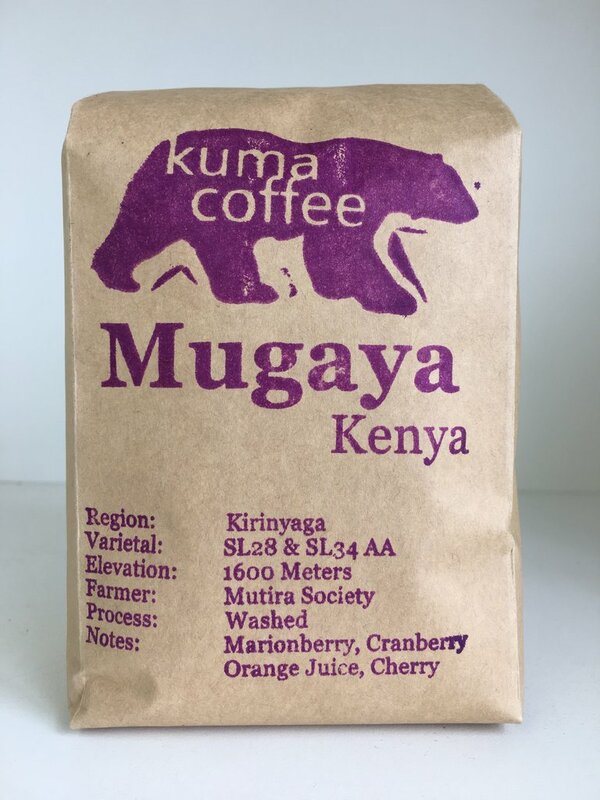 I’m brewing up a washed Kenya Mugaya which is a juicy and tart SL28, SL34 mix from Kirinyaga. Also lining my coffee drawer is a bag of their absolutely delicious natural processed Ethiopia Wenago. 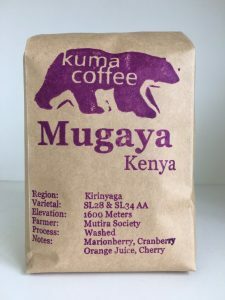 It’s so distinct and fruit-forward, as is the case with many naturals from Ethiopia, but this particular offering from Kuma was a stand-out for me in 2016. Kuma Ethiopia Wenago – this particular offering from Kuma was a stand-out for me in 2016. My Colombian coffee hails from Narino and is roasted by Sweet Bloom in Colorado. Every time I look at a bag of Sweet Bloom, I think of their Carlos Imbachi, which was the last coffee I bought before Neptune Coffee suffered the destructive explosion on March 9, 2016. The Sweet Bloom Santa Barbara is a washed Colombia, Caturra and Castillo mix from Narino and offers a very well balanced cup. It does well brewed on the V60-02 with 19g, Baratza Vario 4M grind, and 320g water. The last brew was about 3m18s with that combination, and was thoroughly enjoyable to drink in between ends while curling (the Olympic winter sport). My staple coffees come from Moustache Coffee Club and feature my latest selection of Guatemala Finca Santa Ana from Moyuta, a Caturra PB with Yellow Bourbon from producer Jesus Recinos. This really shines as espresso, and I’ve been pulling 19g input to 40g output with this on my Rancilio Silvia, ground on the Baratza Encore (at 1 on the grind setting). I really do need to splurge for a Baratza Sette for home or work, I think. The Vario at home is amazing, but the Encore at work is on the edge of acceptable for espresso. In my experience, many coffees from Guatemala have an odd metallic or astringent sort of mouthfeel, and this is one of the few I’ve had recently that doesn’t exhibit that characteristic when brewed as pourover. Interesting thing about Red Whale, in that it was started by a California native while living in the Maritime Province of New Brunswick. I’m excited about that, because I hail from Nova Scotia, their next-door neighbour. On the way to me are a couple coffees from Pallet Roasters, one of my favorites up in Vancouver, BC. I’m looking forward to my delivery of their Colombia Tambo Zarzal, a washed mix of Castillo, Caturra and Colombia coffee. A second bag of their Ethiopia Konga, grown at 1800m and purporting to have delicious tasting notes of lemon curd, orange and raspberry have my mouth watering and my eyes open, watching for the delivery person! And just as I was finishing writing this, I received a gift from friends who recently traveled to Wellington, New Zealand and brought me a bag of coffee from L’Affare . Specifically, their Gusto blend, that was roasted on my birthday and immediately bagged for the flight back to Seattle. I am excited to break into this early next week for espresso. It requires a bit coarser of a grind than my Encore at 1, because I managed to plug up the Silvia on Friday. Will likely try at 5, and work my way back down (or grind at home and transport to work). Well, that’s it. Lots of good coffee for October and into the month of November. I’m super excited for November, and until then, have a wonderful Autumn day, and enjoy good coffee!